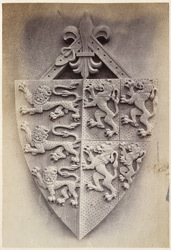 "The third shield is that of King Edward III., as borne by him before the title and arms of France were assumed, viz., - gules, 3 lions passant gardant, or; impaling the arms of his wife Philippa, third daughter and co-heir of William I., Count of Hainault and Holland, viz., - Quarterly, 1st and 4th, or, a lion rampant, sable, hainault; 2nd and 3rd, or; a lion rampant, gules, Holland. This escutcheon typifies the siezure of Queen Isabella and her paramour Roger Mortimer, Earl of March, in Nottingham Castle, through Mortimer's hole. The shield hangs from a fleur-de-lis, the emblem of Edward the III. 's descent from the Kings of France, and his subsequent assumption of their title."